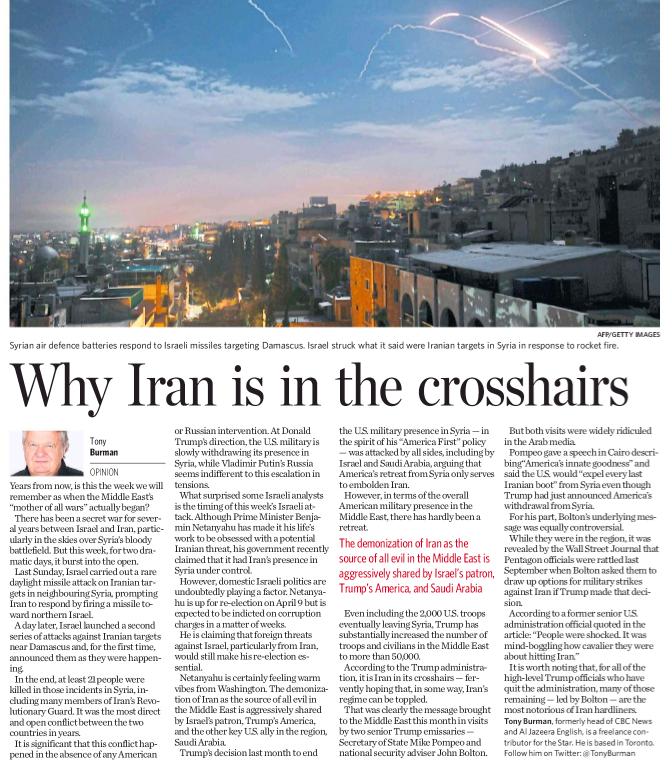 Tony Burman engages in conspiracy theories in his January 26 Toronto Star column by implying that Israeli Prime Minister Netanyahu orchestrated a military escalation with Iran to divert domestic attention away from his legal woes and to gain the upper hand in upcoming Israeli elections. Make no mistake, the only reason “Iran is in the crosshairs” is because it’s the aggressor. Israel is acting in self defence when faced with Iran’s efforts to wipe it from the map and to carry out a genocide of seven million plus Jews. Meanwhile, Iranian Supreme Leader Ayatollah Ali Khamenei’s authored a “nine-point plan” calling for Israel’s destruction. Why is the Iranian Revolutionary Guard Corps (IRGC) inside Syria and why does Iran continue to ship long-range deadly missiles, weapons, and senior operatives there? 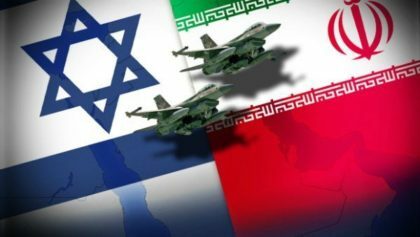 In truth, Iran continues to destabilize the region and its efforts to entrench itself inside Syria is designed to pose a direct threat and military confrontation with Israel. Meanwhile, on the border with Lebanon, Israel recently destroyed 6 Hezbollah attack tunnels that this terror group burrowed inside Israel. Importantly, this terror proxy of Iran has 150,000 rockets pointed at the Jewish state. For Tony Burman to suggest that Israel is carrying out dangerous military efforts against Iran solely for political benefit is without foundation and to not assign blame directly to Iran for its malign activities is morally obtuse. HonestReporting Canada encourages subscribers to write a letter to the editor and send it to the Toronto Star condemning Burman’s anti-Israel conspiracy theories and his failure to assign blame with Iran’s malign efforts. Send letters to: lettertoed@thestar.ca.